Return to the brief flash of the future seen in BATWOMAN: REBIRTH and meet Commander Kane--a battle-hardened version of Batwoman! Hurting from battles unknown, she's taken control of the deadly Colony and declared war on Gotham City! What could possibly cause Kate Kane to bring the battlefront to her home? With writing from Marguerite Bennett (DC COMICS BOMBSHELLS) and James Tynion IV (DETECTIVE COMICS), as well as spectacular art from Steve Epting (CAPTAIN AMERICA: THE WINTER SOLDIER) and Ben Oliver (THE MULTIVERSITY), this new series spins directly out of the smash-hit DETECTIVE COMICS series! 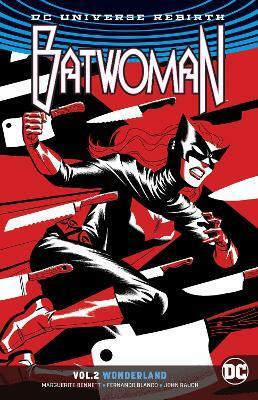 BATWOMAN VOL. 2: FEAR AND LOATHING collects issues #7-11. Marguerite Bennett is a comic book writer working for such major publishers as DC Comics, Marvel, Aftershock, BOOM! Studios, Rosy Press and more. She is best known for projects such as DC's BOMBSHELLS, A-FORCE, ANGELA: QUEEN OF HEL, RED SONJA and INSEXTS. Marguerite is currently writing BATWOMAN for DC Rebirth.